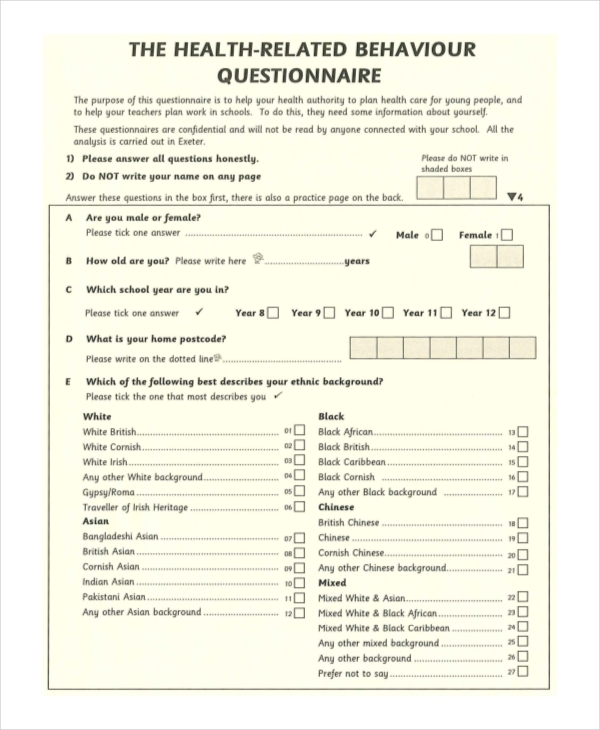 A questionnaire is a systematic tool using a series of questions to gather information. 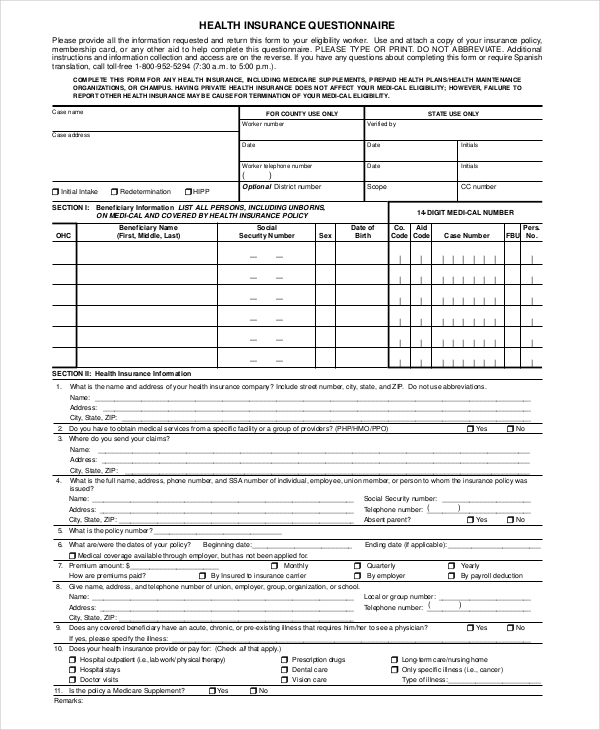 Survey questionnaires are mostly administered to a large group of people in a particular area. These people are known as the respondents of the survey. 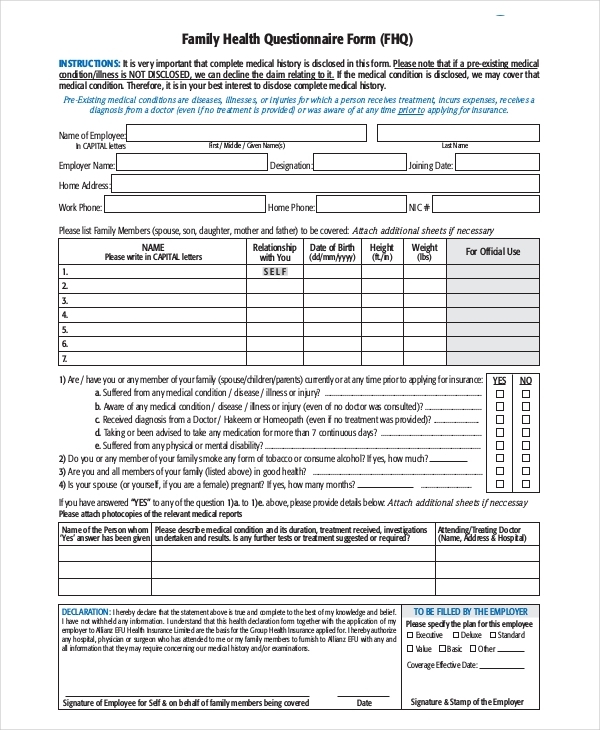 Questionnaires are useful especially in conducting surveys for a research of any kind. Many researchers prefer questionnaires in conducting surveys for its convenience. This is because questionnaires often do not require face-to-face interviews with the respondents, and can be sent simultaneously to a large number of respondents, making it easier and quicker to get the data the researchers need. 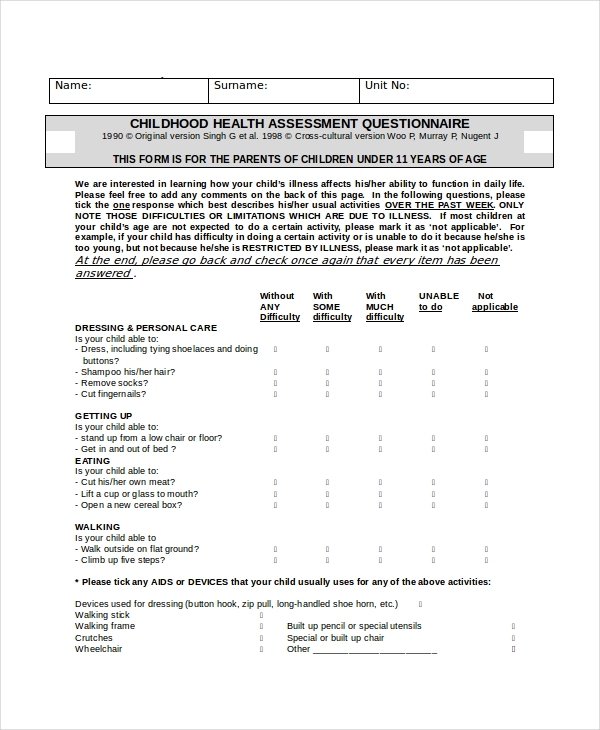 What Is a Health Questionnaire? 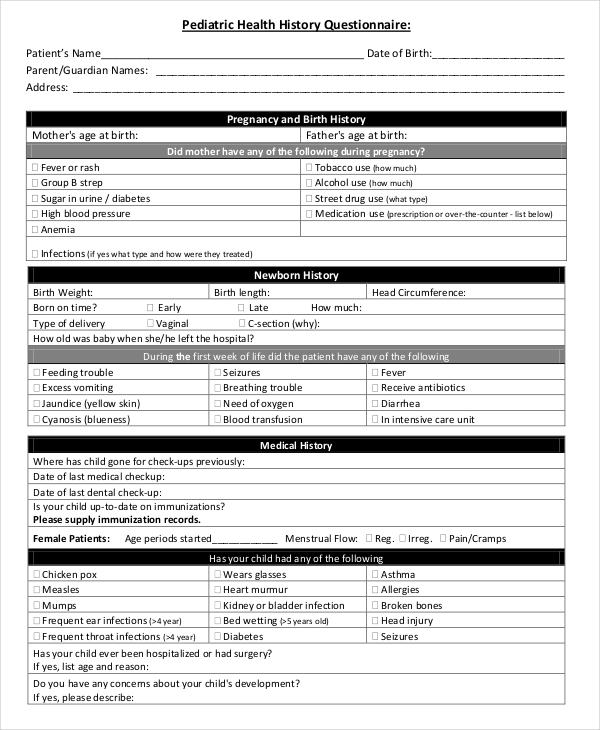 A health questionnaire can be defined as a questionnaire asking a set of questions about an individual’s health. 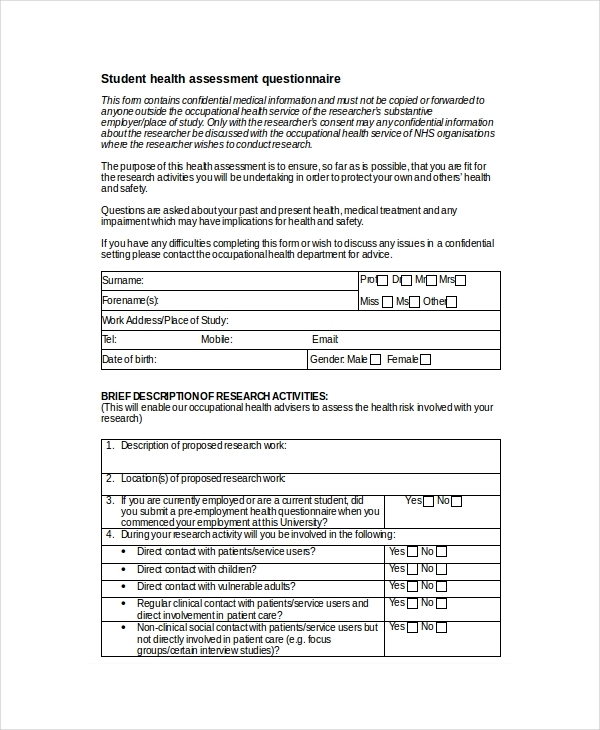 In a health questionnaire, the respondent is asked to answer a few questions regarding his/her overall health condition, health history including previous or current illnesses and medications or treatments, alcohol consumption and cigarette use, physical activity and diet, as well as family medical history. 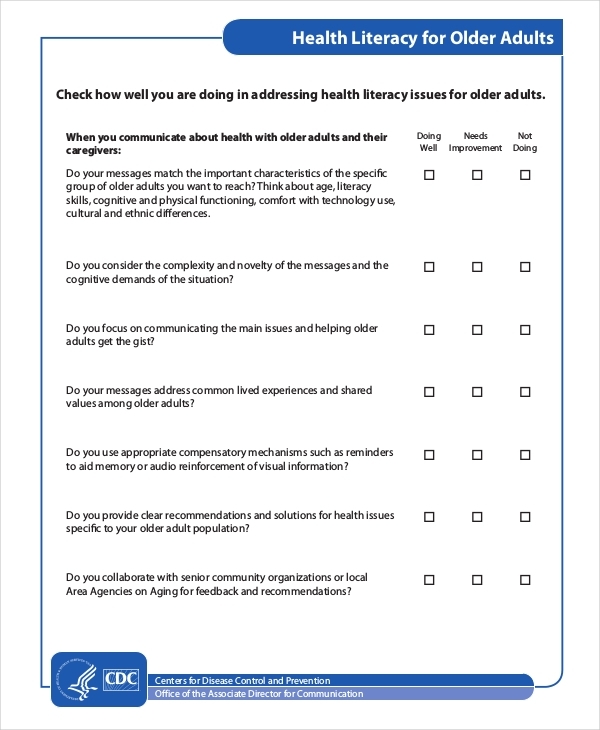 You may also see questionnaire examples. 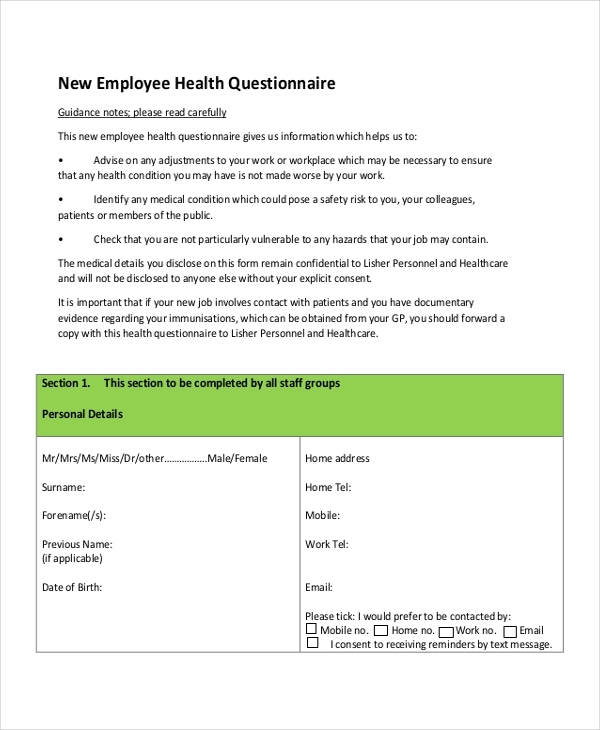 Health questionnaires also include basic personal information (e.g. name, age, gender, weight, height, etc.) including the respondent’s address and contact information. 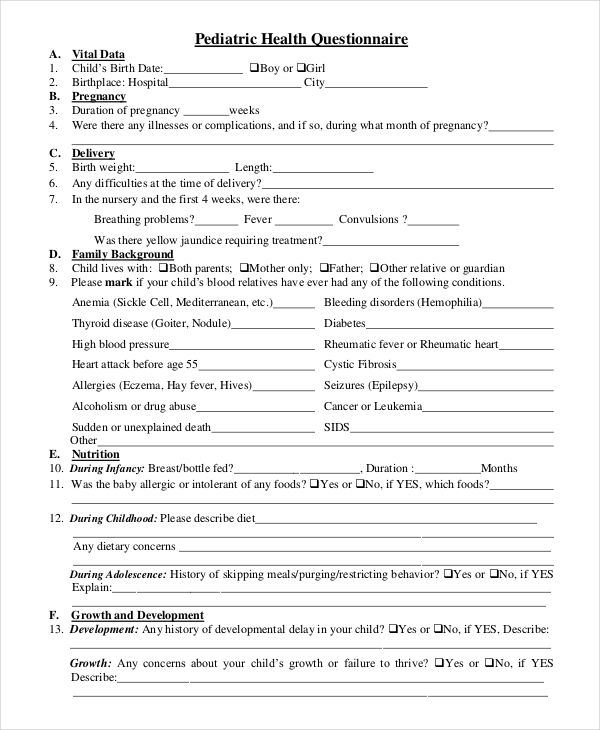 Health questionnaires (e.g. 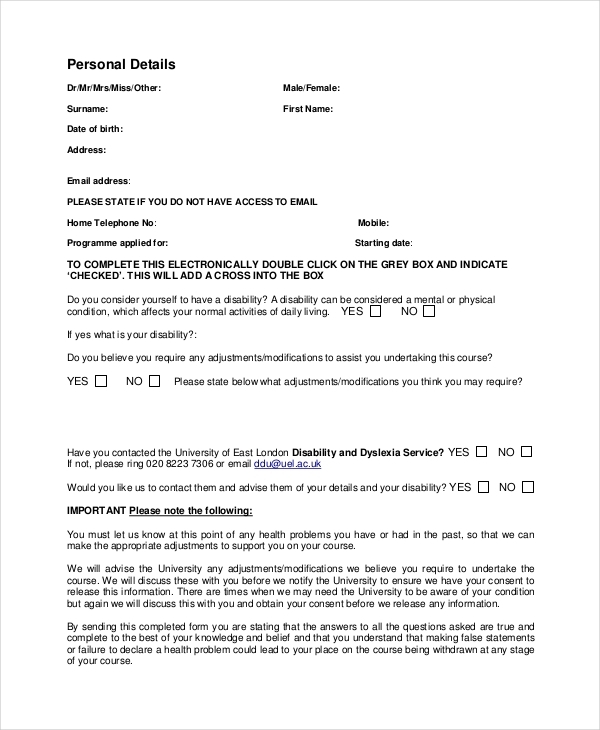 physical activity questionnaire or personality questionnaire) are usually administered upon requesting for a medical checkup, or if an employer or school head wishes to administer them to employees or students. 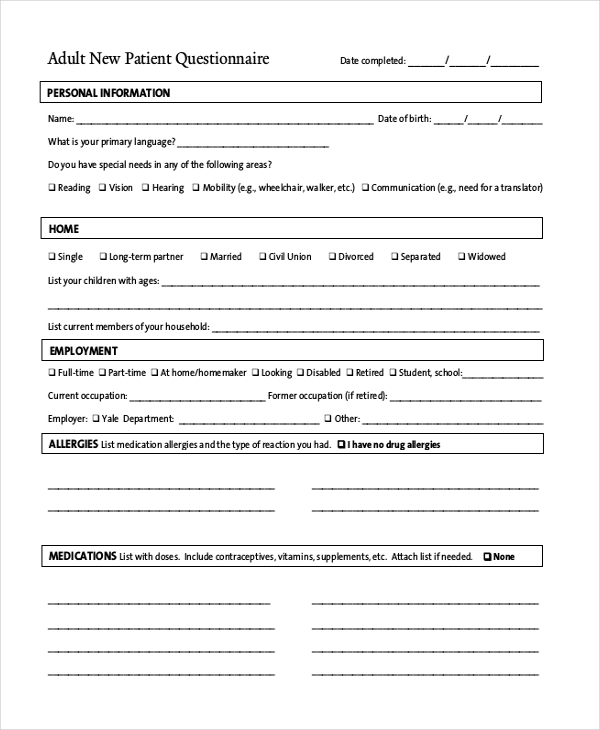 Also, healthcare professionals or providers may use healthcare questionnaires in conducting healthcare surveys. Results of such healthcare surveys are usually interpreted in order to provide a better service to the patients or clients. 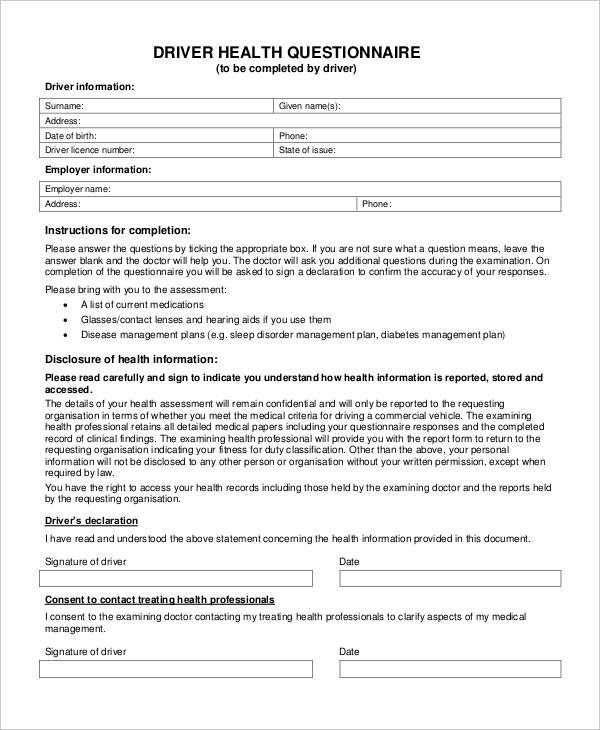 All information being written in a health questionnaire must remain confidential, especially the sensitive ones or those that the patient wants to be kept confidential. 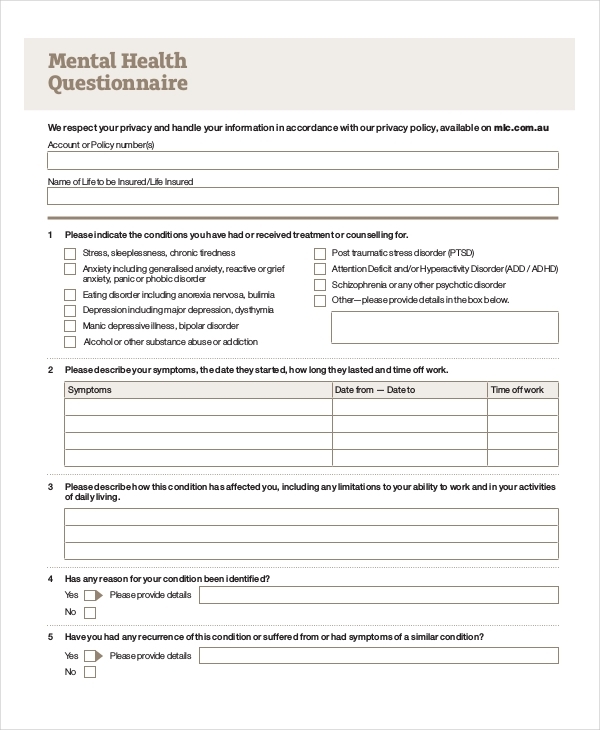 You may also like evaluation questionnaire examples & samples. 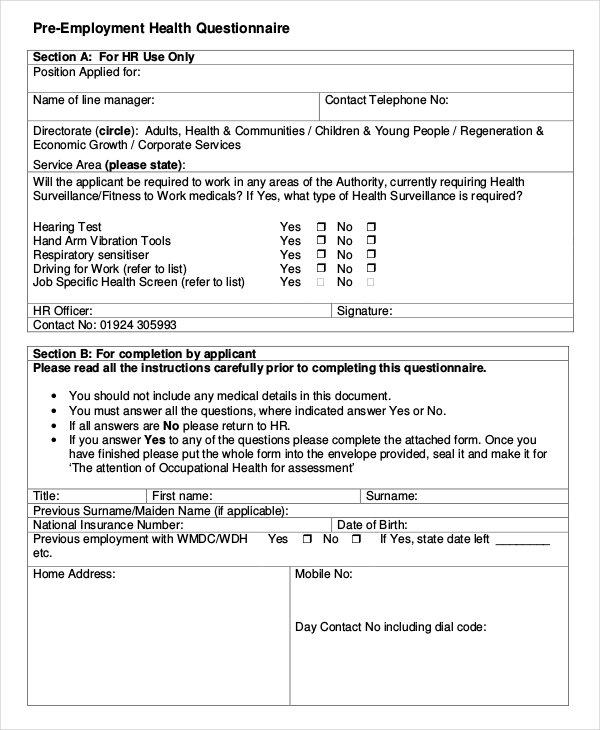 Health questionnaires are often used to screen a person’s physical and mental health. 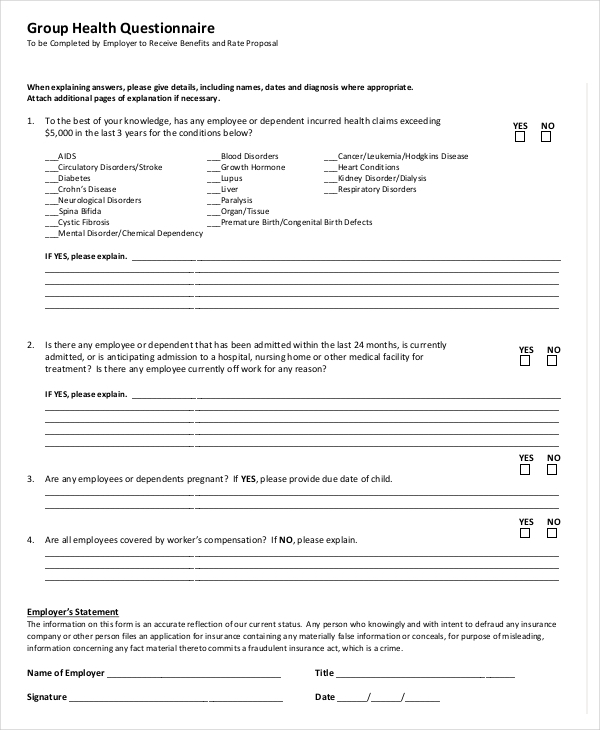 A health questionnaire asks series of questions of which the answers are interpreted to determine any disorder or problem with a person’s overall health. 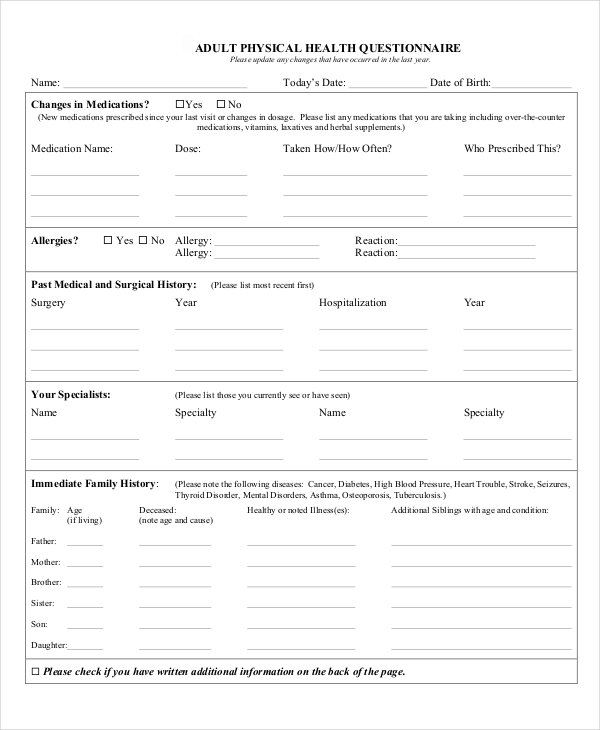 A patient must always answer the questions with all honesty and of course, must input everything he/she knows about his/her health history including his/her family’s medical history. 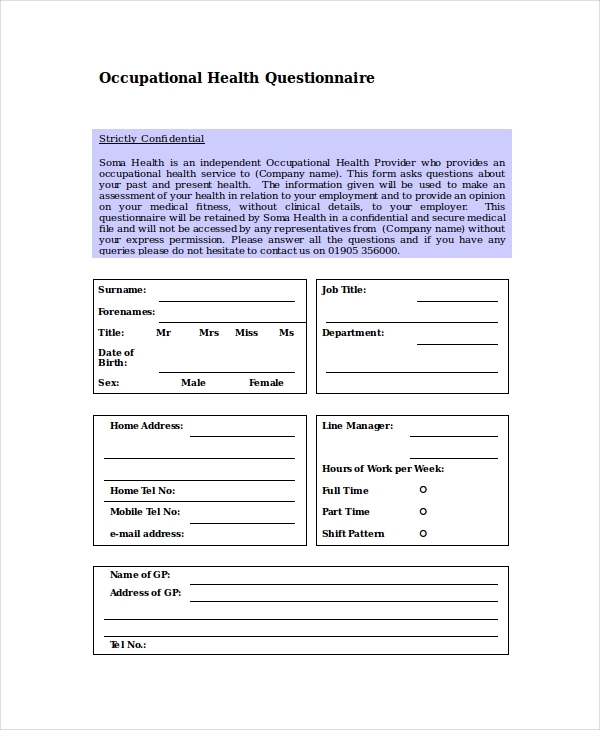 Health questionnaire examples are useful in healthcare surveys and medical research. 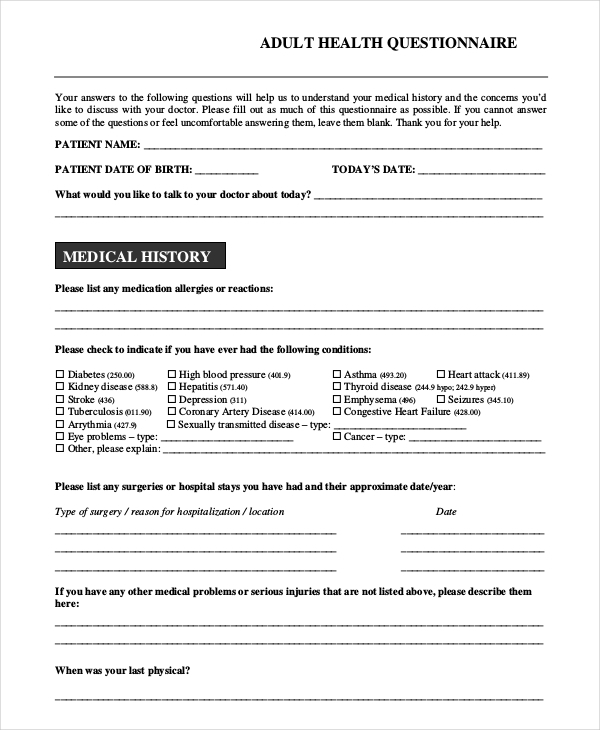 Researchers often use health questionnaires to gather different patient information Patient respondents often prefer health questionnaires from personal interviews because they can have the privacy they need to be able to answer sensitive questions about their health history. Others prefer answering questionnaires since they may be too shy to answer sensitive questions in the presence of another person. 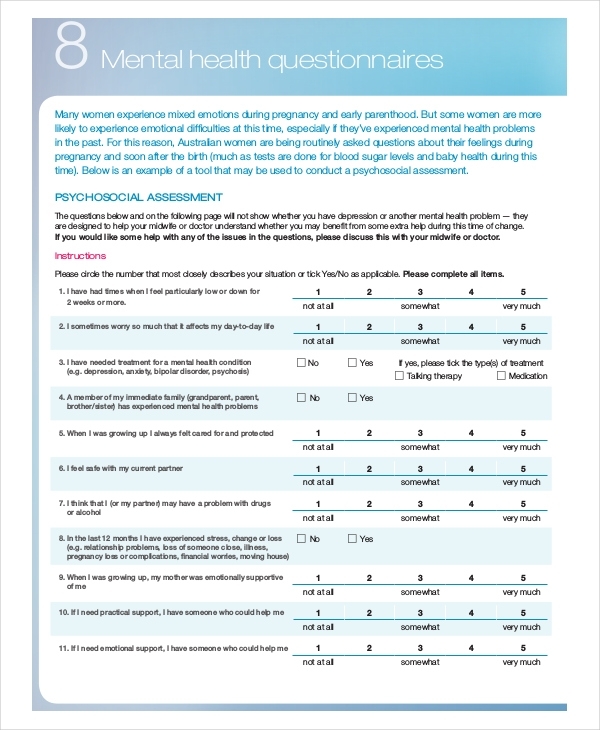 In some cases, results from health assessment questionnaires are used to determine how certain diseases affect a specific community or population. They also help researchers analyze factors affecting the spread of certain diseases, or how these factors affect treatments and treatment availability. 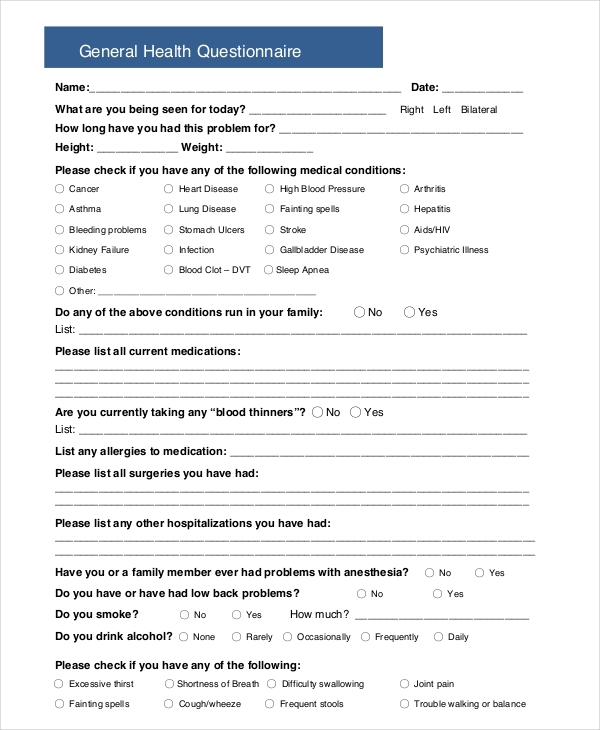 Others use the aid of healthcare questionnaires to determine what treatment or procedure is most effective in treating diseases or what most patients prefer to use in treating particular diseases. 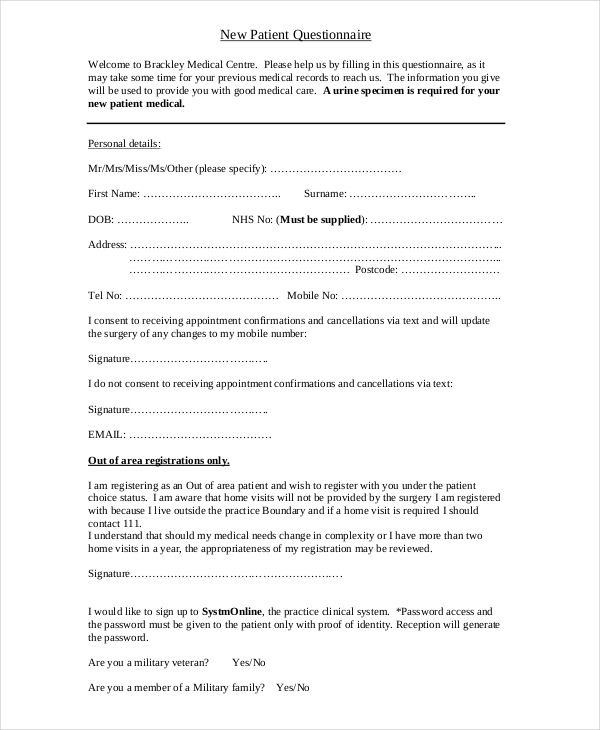 Healthcare questionnaires may also be used by healthcare providers especially when formulating new treatments or procedures. They analyze answers of respondents to identify what kind of treatment or procedure would fit patient or client preference most. 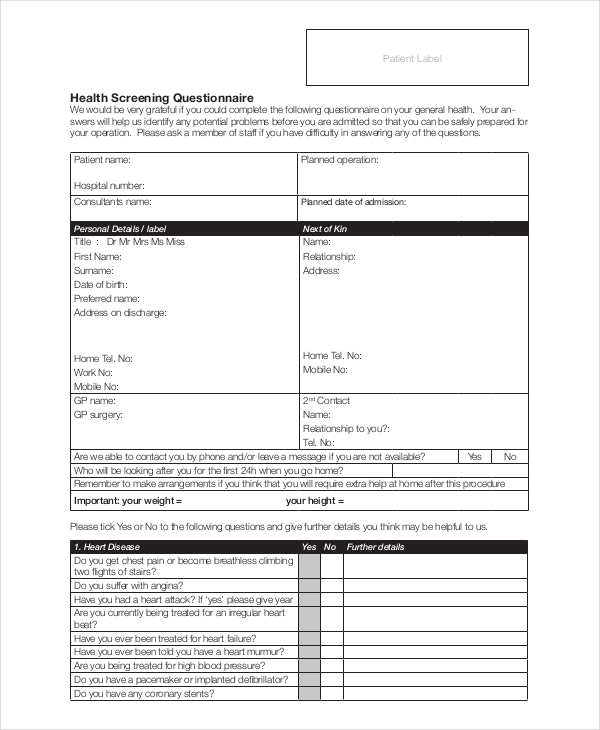 Health questionnaires are equally useful to both doctors and patients. 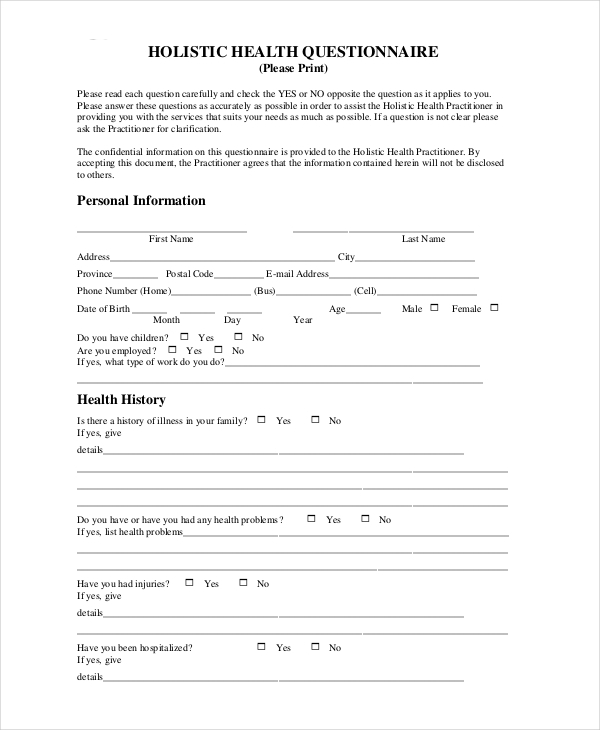 Using health questionnaires, doctors are able to evaluate the overall health status of a patient (including treatments the patient needs if found to have a current health problem). 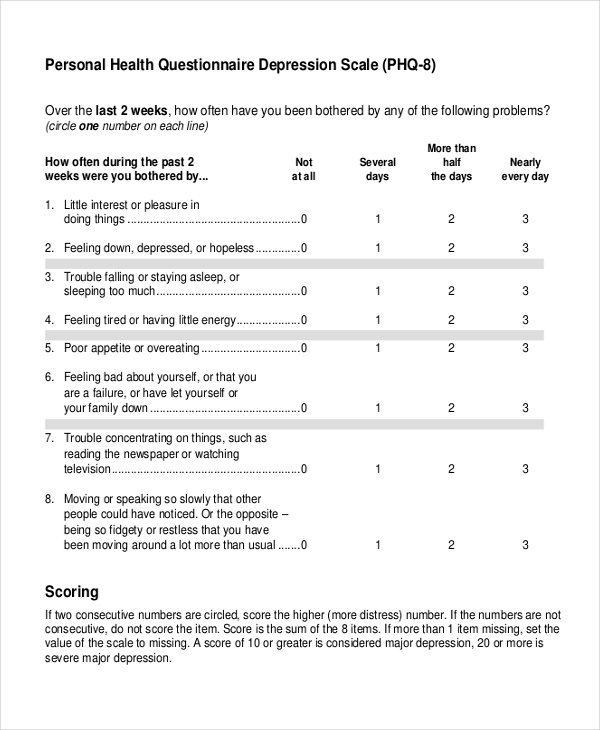 At the same time, patients are given the chance to evaluate their own overall health status. 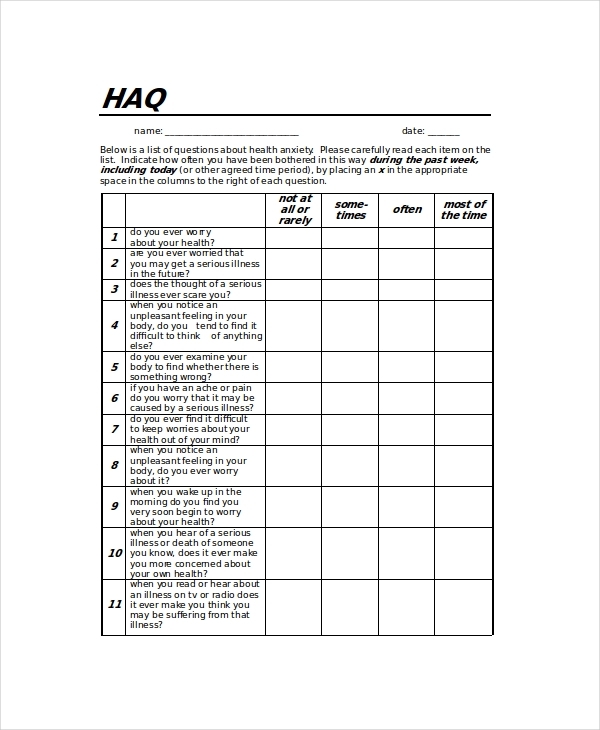 You may aslo check out student questionnaire examples. A patient’s health history contains all details of factors affecting and those which may affect his/her health status. or any other factor affecting his/her present health condition. 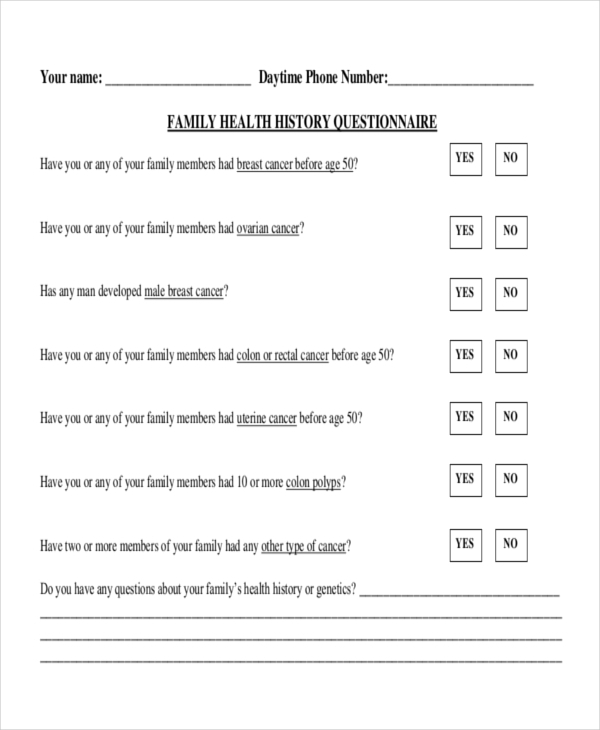 Health history questionnaires may also include questions regarding a respondent’s family medical history, meaning history of alcohol or substance use and abuse, hereditary diseases (diseases that run in the family) or diseases that may have caused hospitalization or death of any family member, and family traditions or culture which may have affected the patient’s overall present health status. 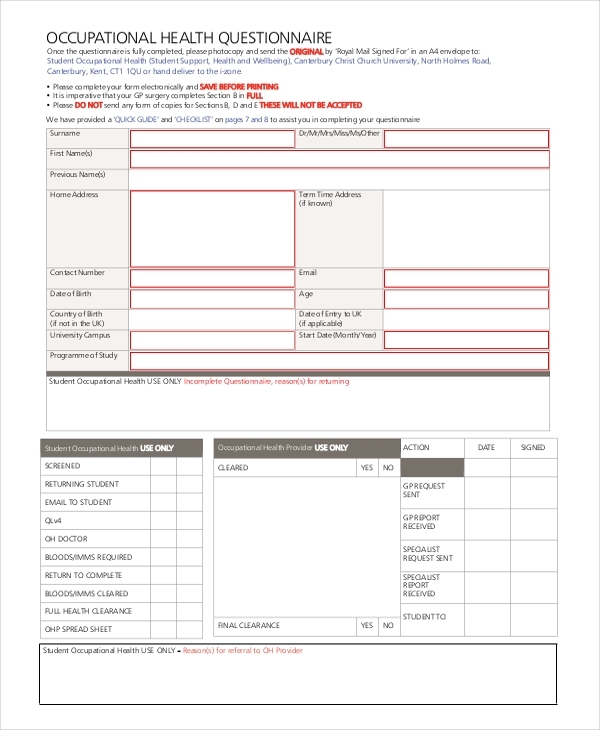 You may also see service questionnaire examples & samples. 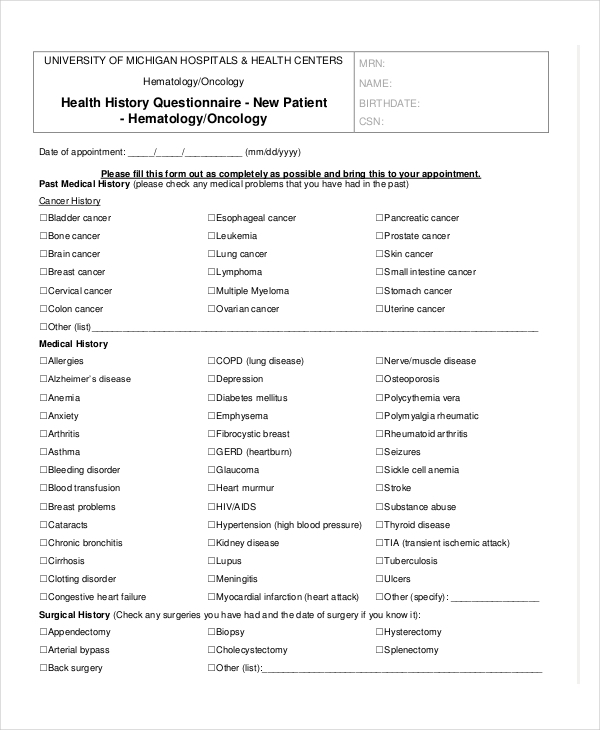 Information gathered from health history questionnaire importance will be essential in determining the factors that may have caused problems (if any) in a patient’s health condition. Any history of diseases within the family will also be taken into consideration in examining his/her health. Results from interpreting a patient’s health history will determine if he/she is prone to any diseases, especially considering his/her present lifestyle. 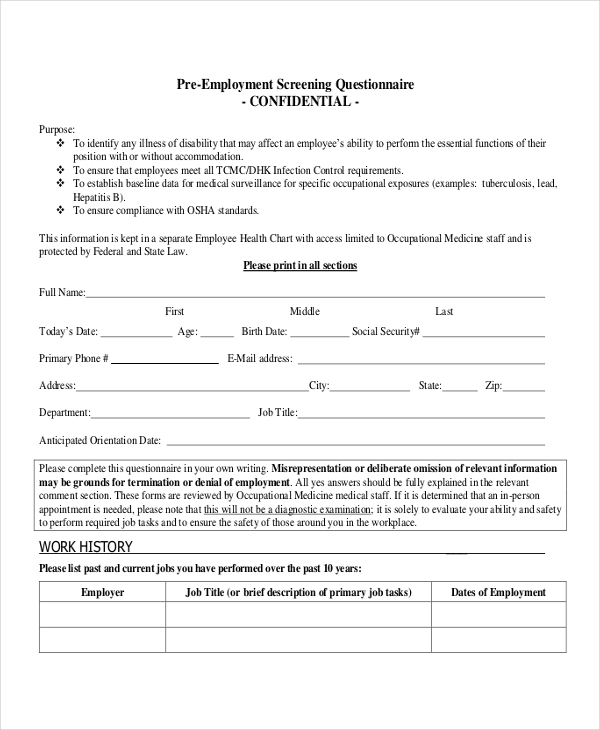 You may also like interview questionnaire examples. Based on these results, doctors or health professionals will advise the patient to change his/her lifestyle to a healthier one in order to avoid contracting such diseases. What is the purpose of conducting this survey questionnaire? 2. Choose a question type. Questions may be open-ended or close-ended depending on what results you desire to have. 3. Make a list of possible questions. What do you want to know about your respondent’s health? Create categories to differentiate your questions. You may group sensitive questions into one category and put it at the last part of the survey. 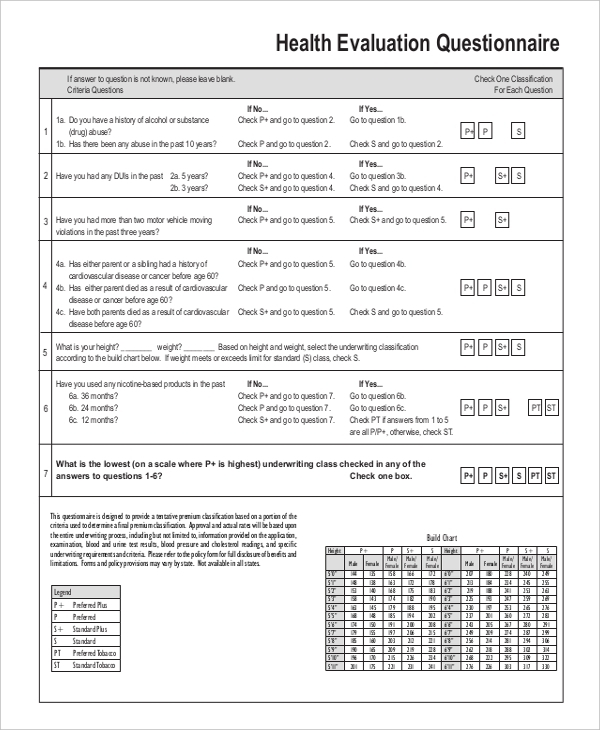 You may also see feedback questionnaire examples & samples. 5. Determine the method of administration. 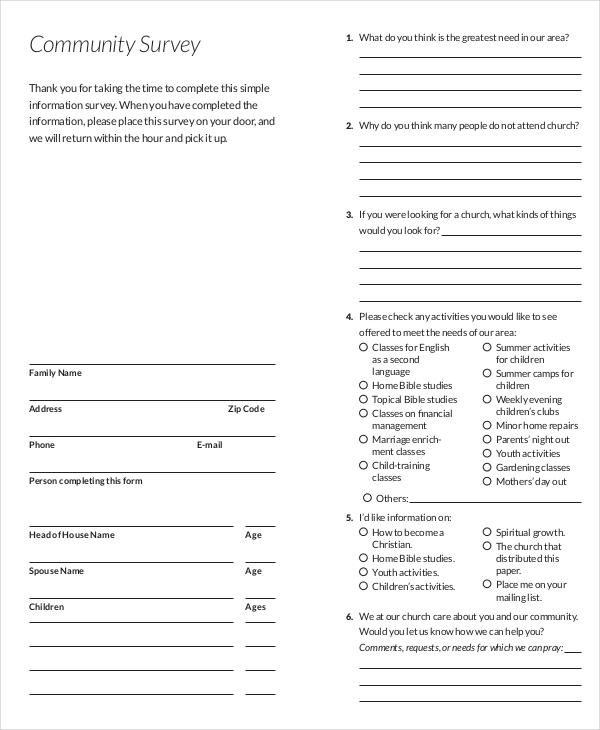 You can choose to send your survey through the mail, electronic mail, or in-person interaction. 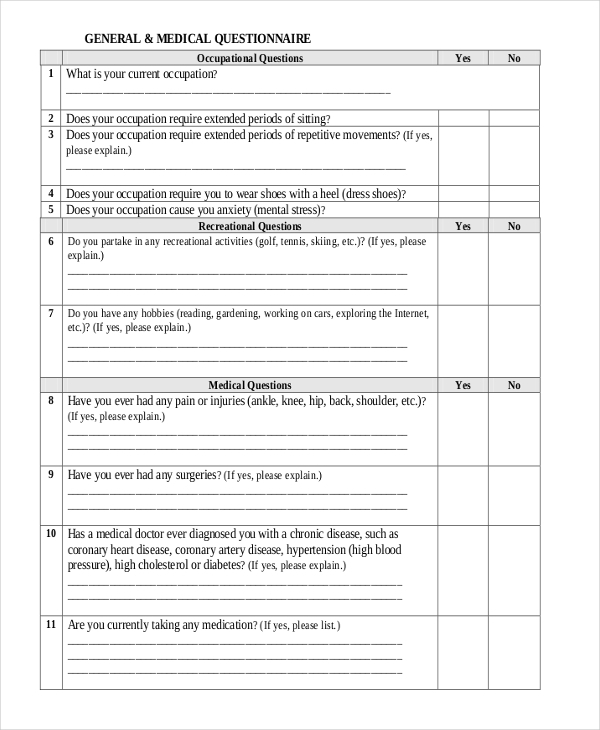 Health questionnaires have quite a lot of sensitive questions for the patient to comprehend, so be nice and provide guidance (especially if respondents find something confusing). 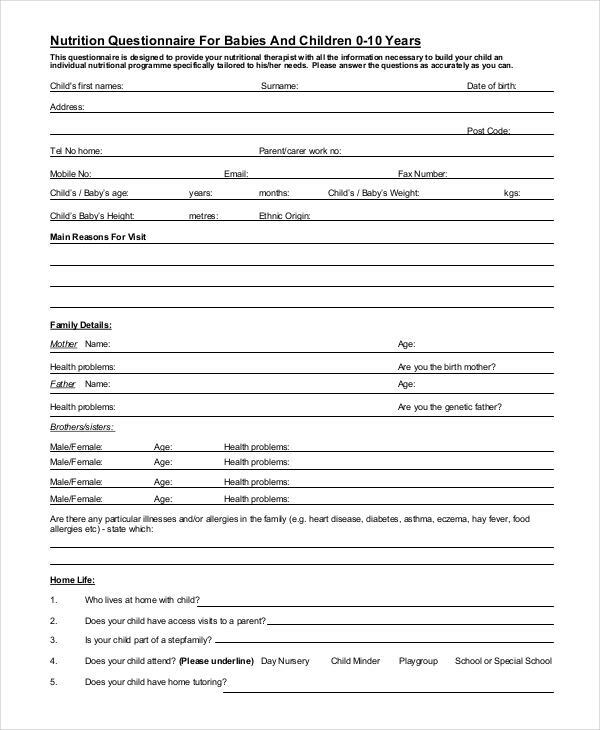 You may also like how to develop a questionnaire. 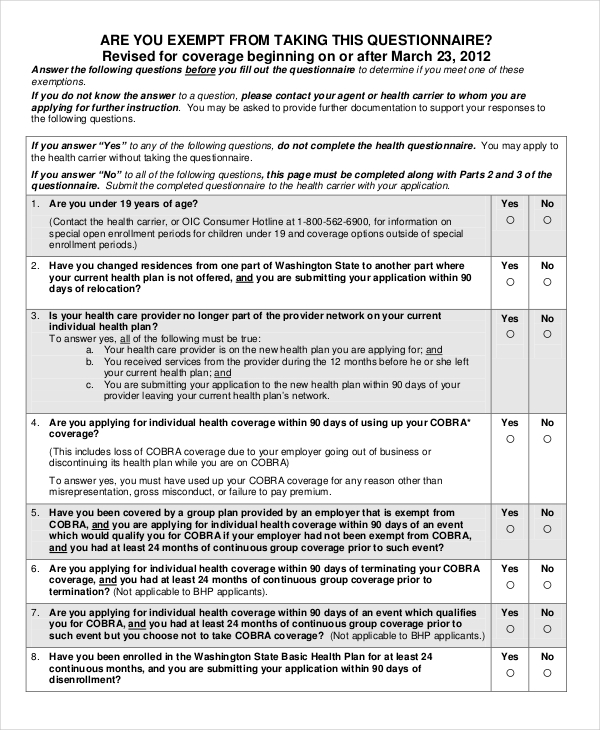 You might want to keep your health questionnaire short (two pages at most will do). 8. Review and revise as needed. Remove inappropriate questions, revise other questions and polish your questionnaire.